click the image to go through to the posts. 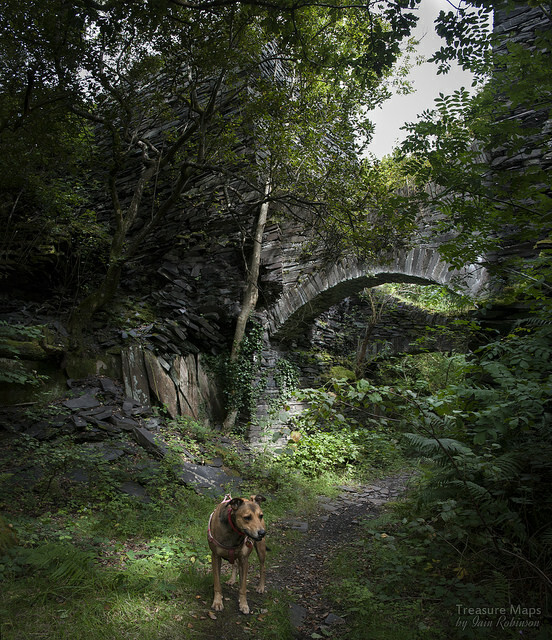 A walk along the remains of a 3'6" quarry tramway, from Talysarn, through Dorothea, to Pen yr Orsedd. I'm migrating away from Blogger. It's been a good spell, seven years on this platform, but nothing stays the same for long on the internet and I feel I've outstayed my welcome. Google appear to be wondering what to do with Blogger and to be honest, it has become more unwieldy and difficult to use for a while now. Comments not working was the last straw. 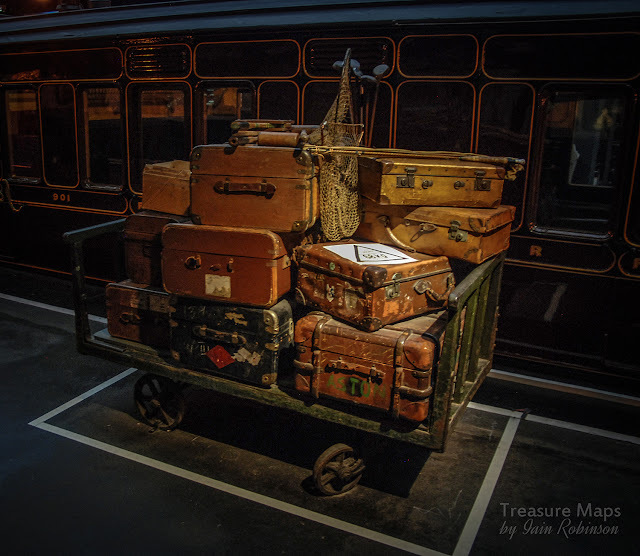 But "Treasure Maps" is not dead, I will be on my own, new platform and will be re-posting everything worth re-posting from here...eventually! So stories of my stumbling about and being kept right by Petra will continue, you don't get away that easily! The new site will be more in-depth and feature more photos and albums, in pale imitation of the two best I.A. 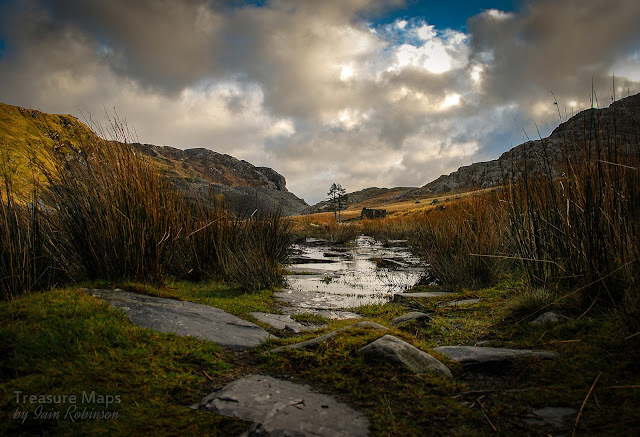 sites out there, Dave Sallery's Penmorfa and JAW. So...thanks for viewing, for all your support and comments, your letters, and suggestions, all hugely appreciated. I hope to see you over at "son of" Treasure Maps soon! 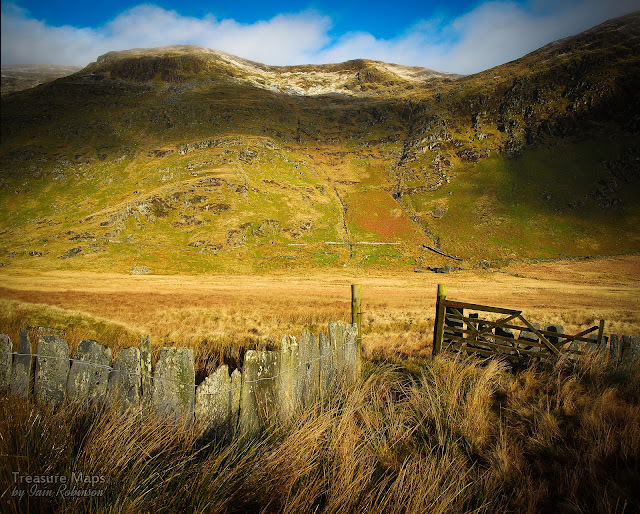 Capel Rhosydd, seen from the Rhosydd tip. 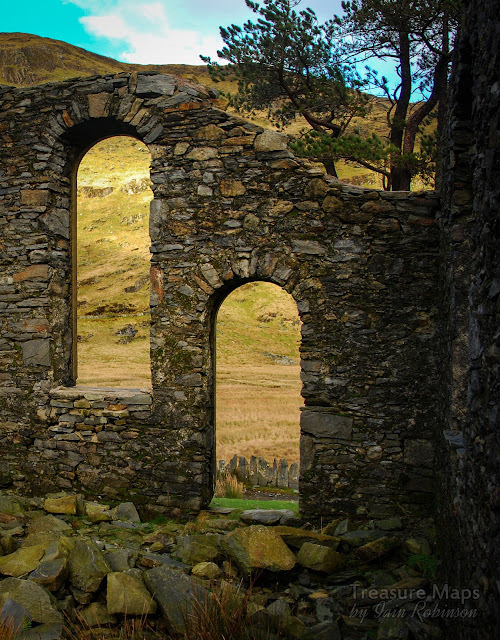 The second of my occasional photographic wanders around Cwmorthin, this time focussing on the chapels. Yes, there are two! The first needs no introduction and is almost, in the current parlance, an "iconic" feature. Capel Rhosydd (also known as Capel y Gorlan and Capel Conglog), is a gaunt shape sited by the track where the tramway diverts across the fields, behind a slate slab fence. It hasn't always looked so neglected. Many local folk remember the chapel with a roof (some even profess to know who stole the slates). Photograph of Capel Rhosydd in June 1995 by kind courtesy of Dave Linton. Given that the quarrymen at Cwmorthin were for the most part a civilised, educated and god-fearing band of workers, it isn't surprising that a chapel was built for the families and children as well as the men themselves. The building was paid for, not by the quarry company (of course not, why would they do that?) but by subscription from the men themselves, costing between two and three hundred pounds. 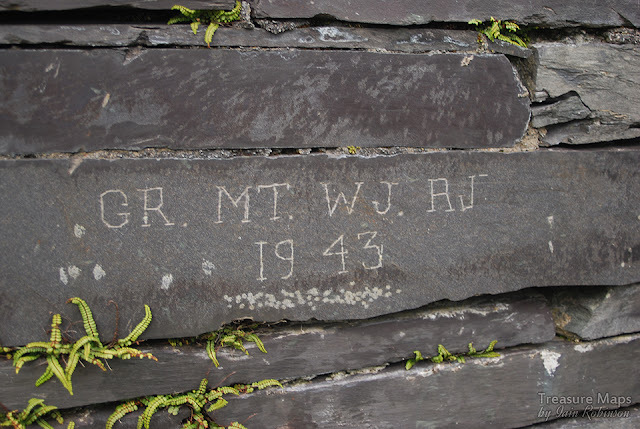 A school for the children of the quarrymen in the valley was founded in 1855 by Thomas Jones and Griffith Evans, based in Cwmorthin Uchaf farmhouse, although the accomodation was less than satisfactory. It found a permanent home at the chapel in 1867. 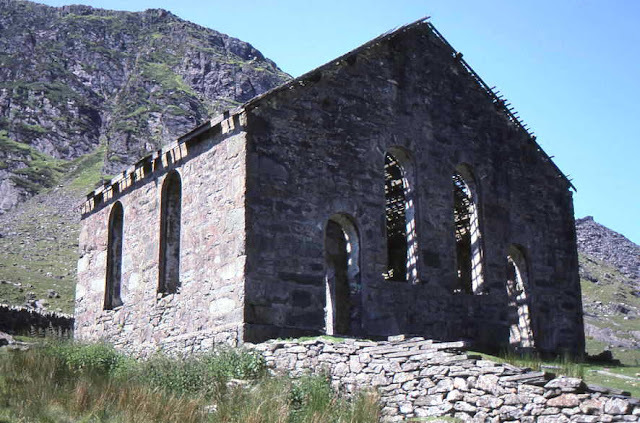 I won't plagiarise the excellent research done by Cofio Cwmorthin, but refer the interested reader to their site for much more detail on the chapel. Suffice to say that the chapel has appeared on book covers, calendars, numerous web sites and albums and is a much-loved landmark. It's something of a milestone for me, as I usually have a cup of coffee from my flask, sitting in the shelter of the walls, when returning from an expedition in the cwm. 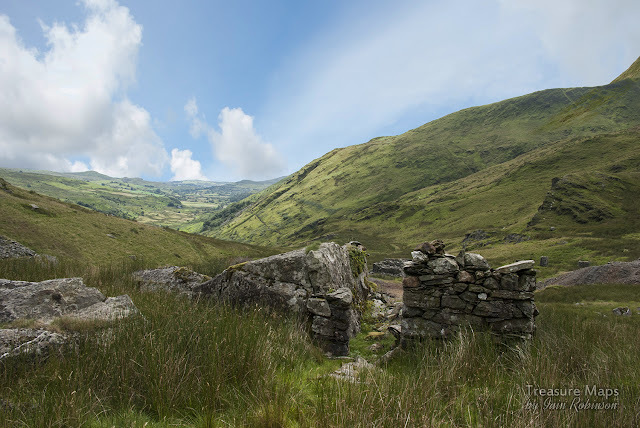 On my most recent visit, I had intended to go up the flanks of Foel Ddu, and had followed a track marked on the map, going up the slopes to the north of the chapel. This was obviously a right of way remembered by the OS, but in 1890- before Rhosydd had started tipping so energetically. By now, it had become more of a scramble/severe climb near the top. At this point the wind was so fierce that I could hardly stand! 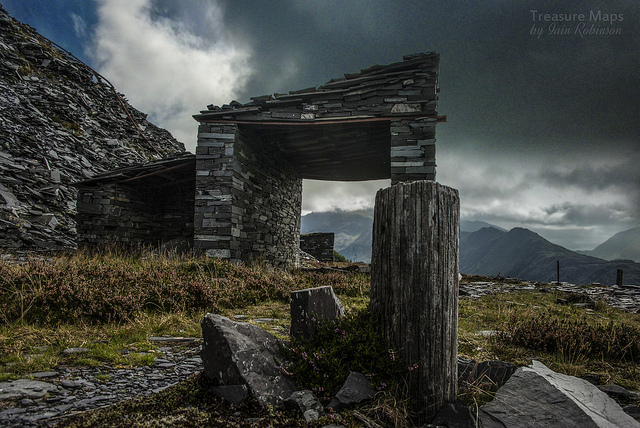 I ended up wandering around the relative shelter of Rhosydd that day. But back in the chapel on my return, I sat and savoured my flask of "Grumpy Mule", listening to the wind howling round the walls. It was hard to imagine the bank of pews, or the minister giving a sermon amid the ruins and yet, there was something of an atmosphere. I've mentioned Jan Fortune's poems about the cwm before now, and her lines about the wind singing hymns in the walls was never more true. I felt somehow as if I had been granted asylum for a small time, out of the wind which was now becoming very strong indeed. A party of walkers passed outside, bent like soft alloy against the forces of nature, yet there I was, sipping coffee like a gent. Luckily, no stones fell off on me, and I walked out into the gale, the elements harrying me down the cwm and out to the car park for the short drive home. The second chapel is an interesting one. 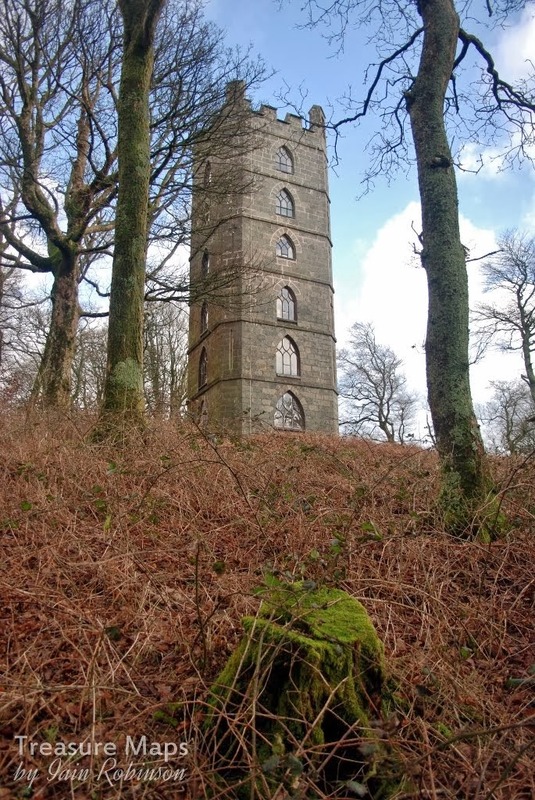 It predates Capel Rhosydd by a year and was built to hold a hundred devout souls. It must have been a tight squeeze, because that seems an optimistic estimate to me. Capel Tiberias, as it was known, was an independent congregational chapel, built at the same time as the cottages of Tai Llyn, the barracks at the threshold of the cwm. 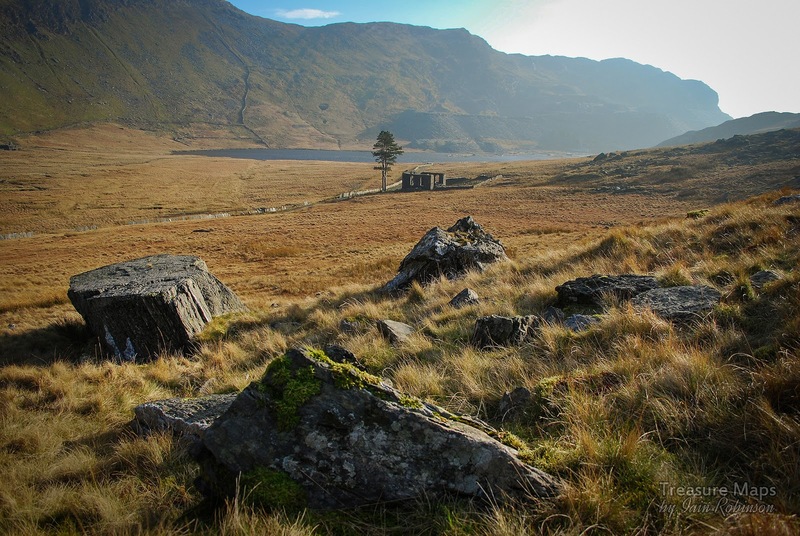 There are no records as to how it was funded, but it was used by Cwmorthin and Wrysgan men and their families as far as I can ascertain. There is still a reasonably defined track leading to it and it holds a good position in a sheltered lee of the hillside. These days it is little more than a pile of stones and no photographs have yet been discovered showing how it might have looked during it's use. 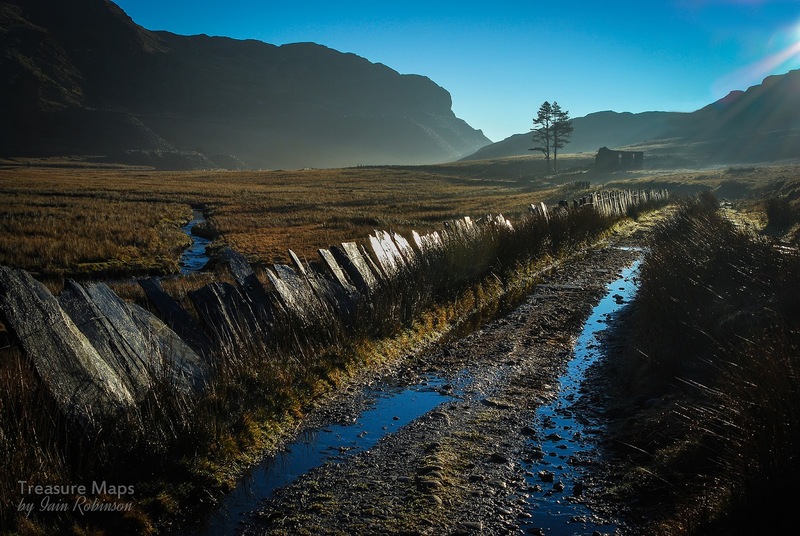 Some interesting photographs on my learned colleague Alen Mcfadzean's blog, "Because they're there"
I am lucky to live less than five minutes away from the car park, yet in the last ten years I have only visited Cwmorthin a handful of times. Couple of years ago, the message boards of AditNow had been afire for five minutes because a new group had sprung up: Cofio Cwmorthin Remembered. 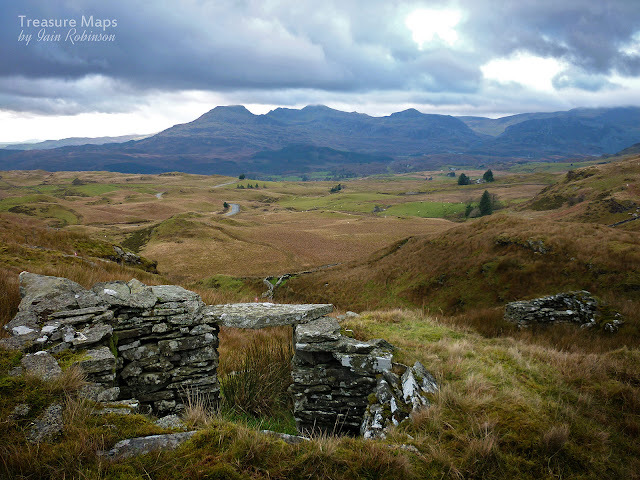 They were an informal bunch of like-minded folk who wished to conserve and study the cwm. People as far away as Birmingham got very opinionated. Footpaths were mooted, and interpretation boards. There was a modest grant awarded to the group and some people had definite ideas on how that should be spent. 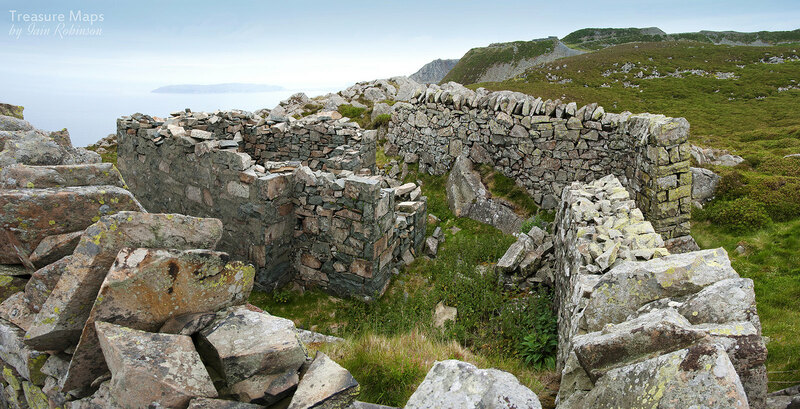 The like-minded folk of Cofio Cwmorthin just got on with doing good things like conserving crumbling structures, making proper archaeological studies- and publishing what they had found on the web. I still didn't visit. 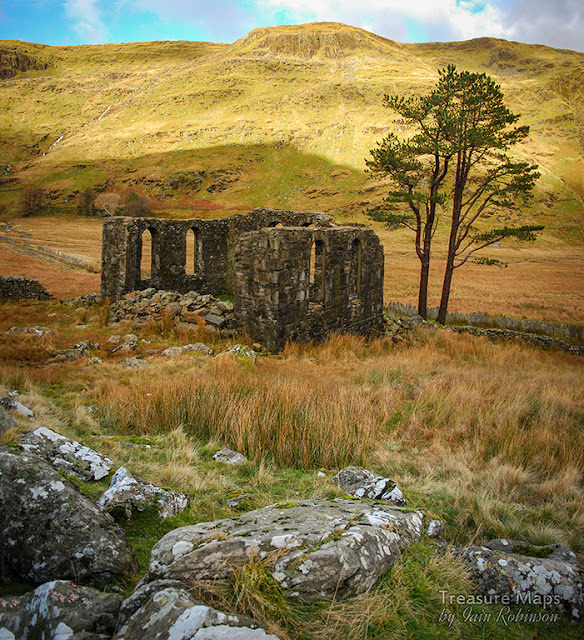 The last time, it was a Sunday and I remembered that the place was crawling with folk in co-ordinated walking gear, camo-clad mine explorers and off-road trail bikers. There was no peace, as the two strokers tore up the silence like an unacceptable ransom offer. There were children, too, with their parents- enjoying the paths and exploring the old miner's houses, eating sandwiches and drinking pop. That last bit made me smile. Perhaps this old curmudgeon wasn't entirely turned to stone after all. There's some good literature out there about the place. Jan Fortune, John Davies and the late Gwyn Thomas have all written poems about the cwm, evoking various interpretations and feelings. Every one of them left me with a particular image that resonated. 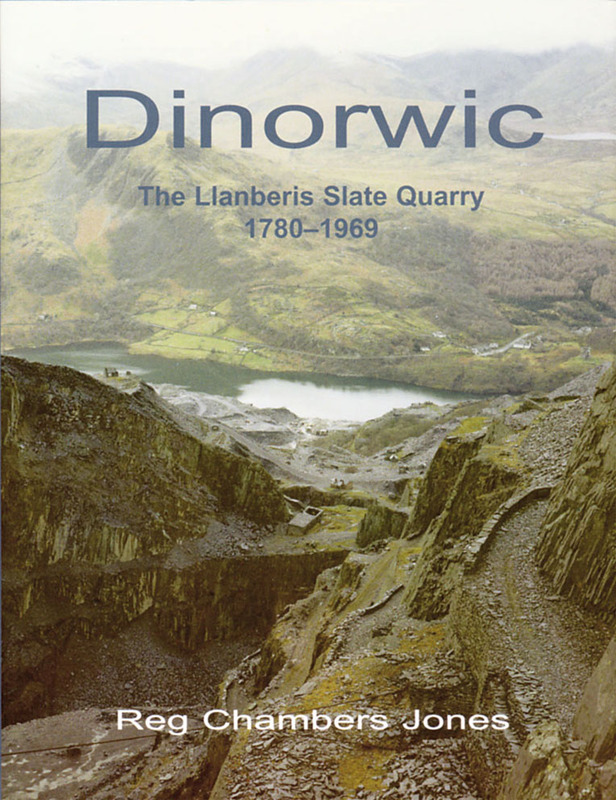 There's Graham Isherwood's masterwork about the quarry and Lewis and Denton's magnum opus about Rhosydd, both as rare as hen's teeth, but worth selling the family silver for. Celia Hancock and M.J.T. 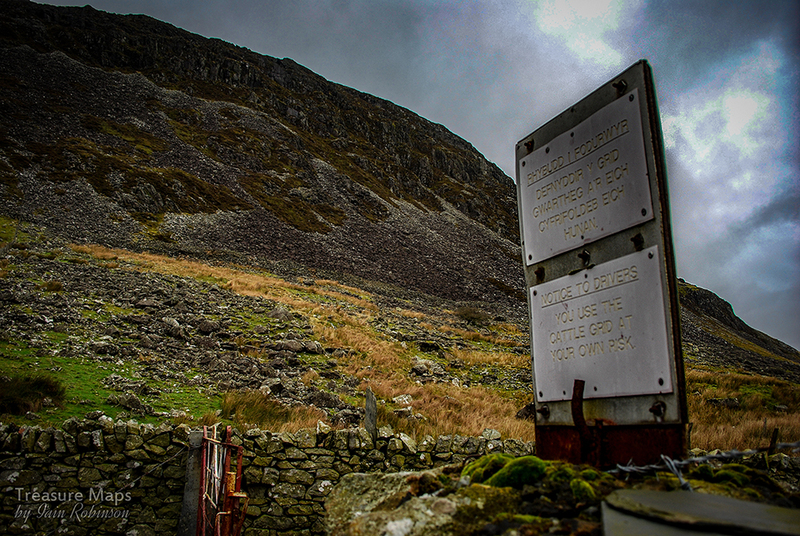 Lewis have written a small but powerful history of Conglog Slate Quarry, at the end of the cwm. There's the excellent Cofio Cwmorthin website. So, one chill morning in the depths of winter, I took my camera out for a walk up there, thinking to take some shots in the bright unseasonal sunlight. There was nobody about. Just a few ravens and a farm dog freelancing up on the hill. Since then, I have been returning two or three times a week in different weather conditions, making up for ignoring the place, turning it into something of a project. Because there's no half measures with me, either I'm not interested, or I'm all over it. 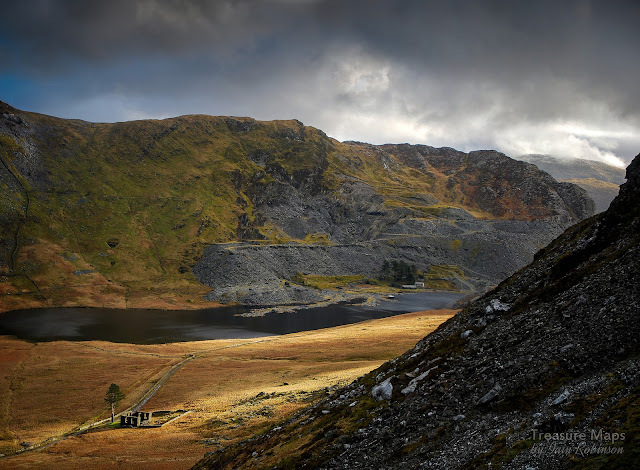 So for the next year or so, interspersed with normal transmissions (and there are a lot of those, if I can just get round to finishing them) there will be articles and photos about various features of Cwmorthin. A modest attempt, for better (or more likely worse), to document the place. Cwmorthin sits like a drop of sunlit dew in a morning spider's web , a magical hanging valley above Tan y Grisiau; deserted of human habitation but not of memories. Two-strokers run out of fuel eventually, or get bored and go home. Everyone else has every right to enjoy the place and find whatever it means to them. Gwyn Thomas called it a "cup of loneliness". 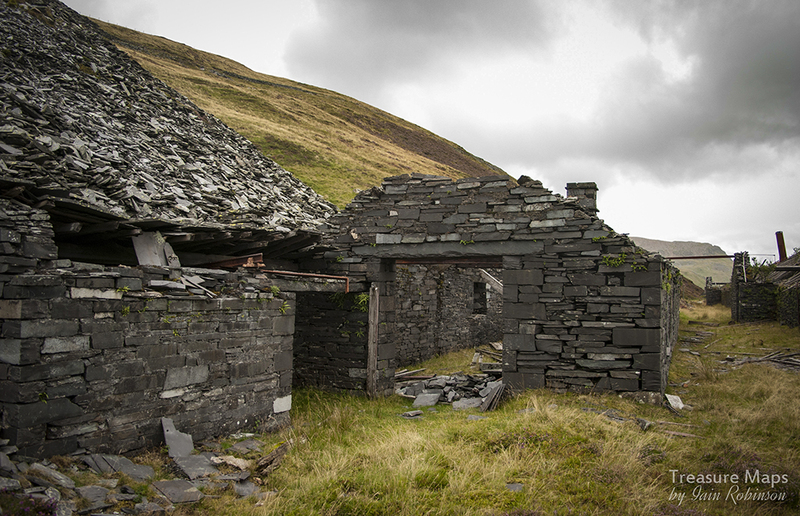 John Davies thought it "hung, cracked in Blaenau's draughty rafters" while to Jan Fortune, the "winds whined hymns that haunt the Sheepfold still..."
I might find out what it means to me. 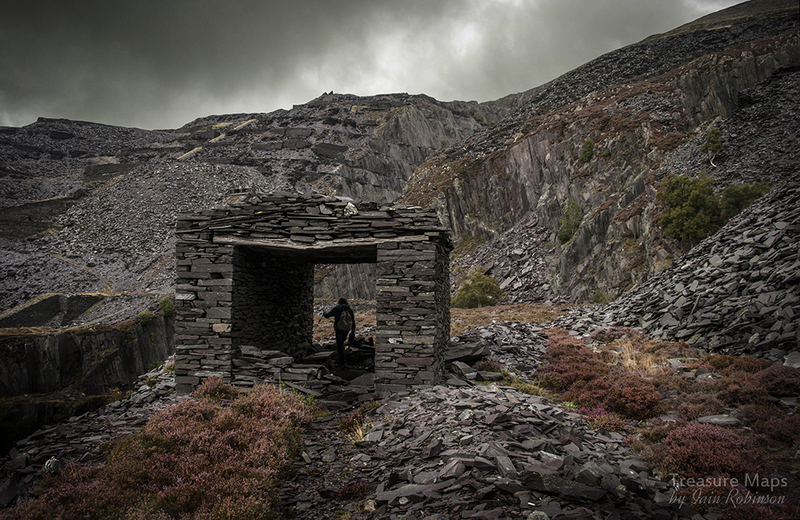 The Manod Powder Store with the tips of the modern quarry behind. Of all the ancillary structures associated with mines and quarries, gunpowder magazines are, for me at least, among the most fascinating and most rewarding to locate. They are usually sited a good distance away from the mine for safety reasons, and are often of a distinctive design. Sometimes the magazine is an obvious feature, but more often than not, it has to be searched for among undergrowth and there is always a feeling of achievement when it has been identified! 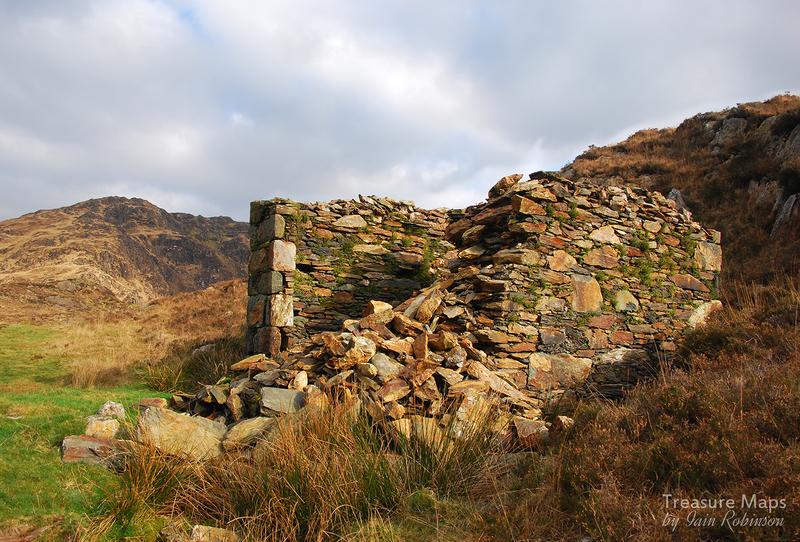 The ruined powder house at Hafod y Porth, near Beddgelert. There seem to be a few designs that are repeated, probably due to their inherent fitness of purpose, but that still leaves room for a number of non-typical relics to be found. 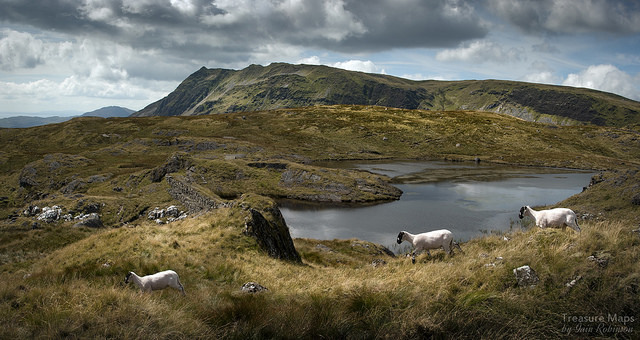 Probably most numerous, especially here in North Wales, is the round variety. These can be found everywhere mining took place. 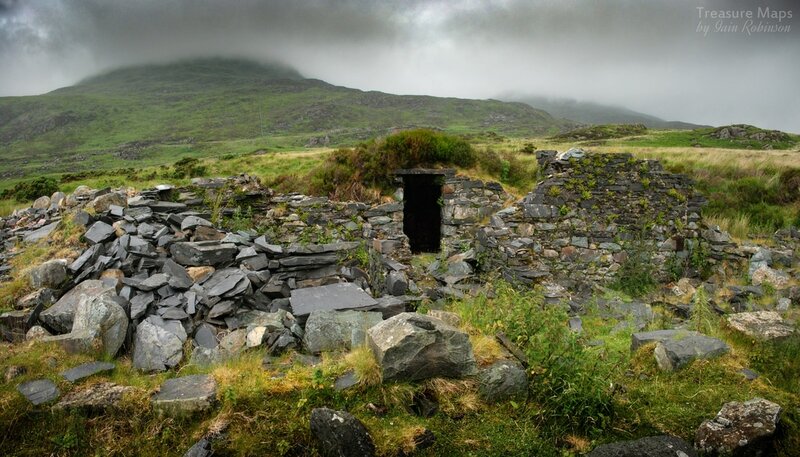 The square or rectangular variety is also common, and is identified usually by it's lack of windows and flimsy roof. (Usually completely rotted away by now). The walls were invariably lined with wood, presumably to guard against damp. 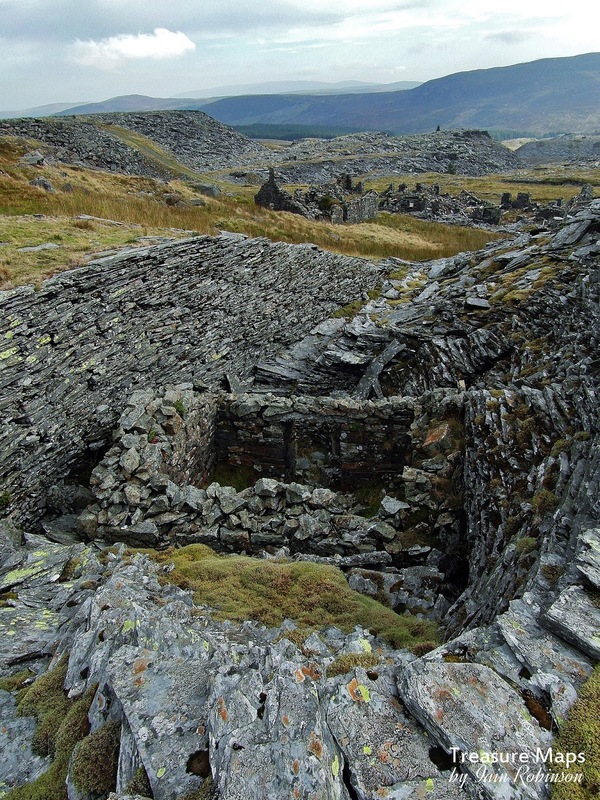 The powder magazine at Manod (Bwlch Slaters) is a good example, the wood lining surviving despite the hellish weather conditions experienced in this cwm during winter. It was intended that, should there be an explosion, the blast would be directed upwards and would blow the roof off rather than reduce the walls to so much shrapnel! The "new" magazine at Cwt-y-Bugail. This replaced an older one which was set in a defile next to the level A-B drumhouse. 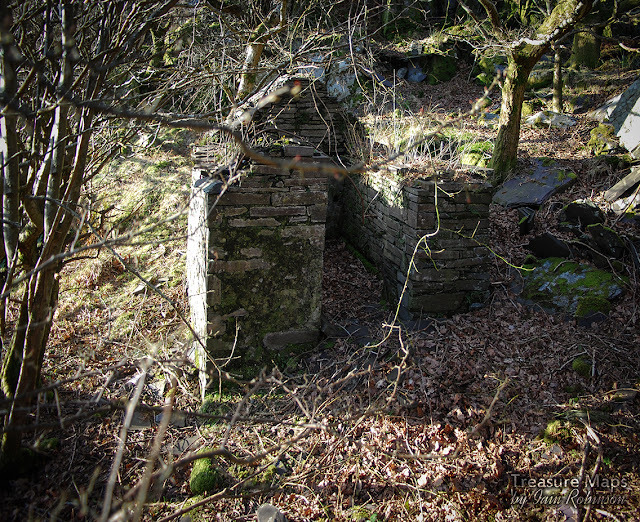 The original magazine at Cwt-y-Bugail, which probably served the upper quarry before the mills at level B were built. Then there are the non-standard examples...most folk know about the "Beau Geste" fort powder store at Cwmorthin, now sadly lost (demolished by the quarry in the eighties), but there is an almost equally fascinating example at Penmaenmawr, with wing walls guarding it on the top of a promontory overlooking the sea. The very interesting structure at Penmaenmawr with outer protecting blast walls. There are a couple of "Keyhole" examples, most notably at Graig Ddu but also to be found elsewhere. With these types, there is an entrance porch usually cut into the ground, which leads to a small chamber where the explosives were kept. Imagine a heavy duty "igloo" shape made out of stone. 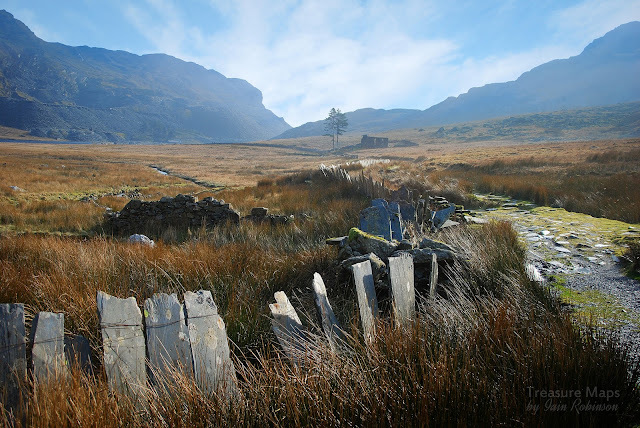 The Cwm Teigl store...Chwarel Llew Twrog is just out of shot at top right. 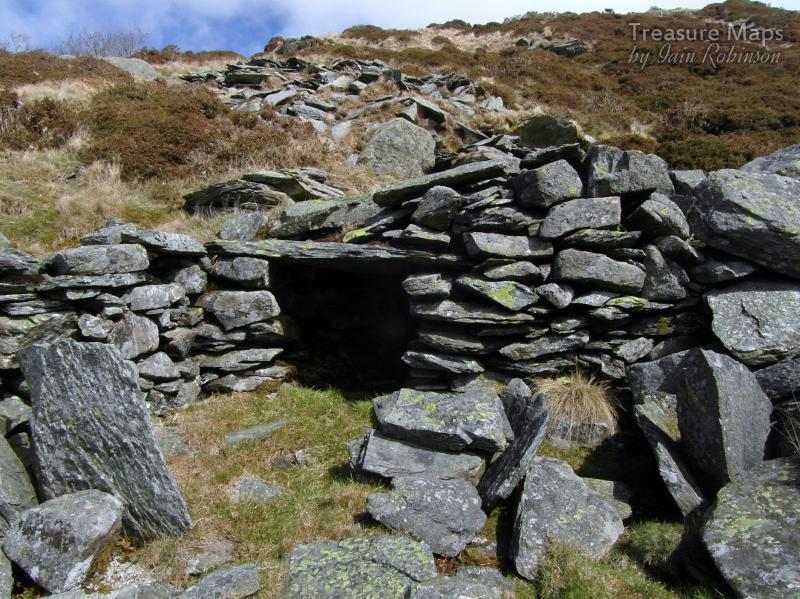 Then there is the mysterious shelter in Cwm Teigl which experts attest is a hut with a vaulted roof...I think it is a powder store. 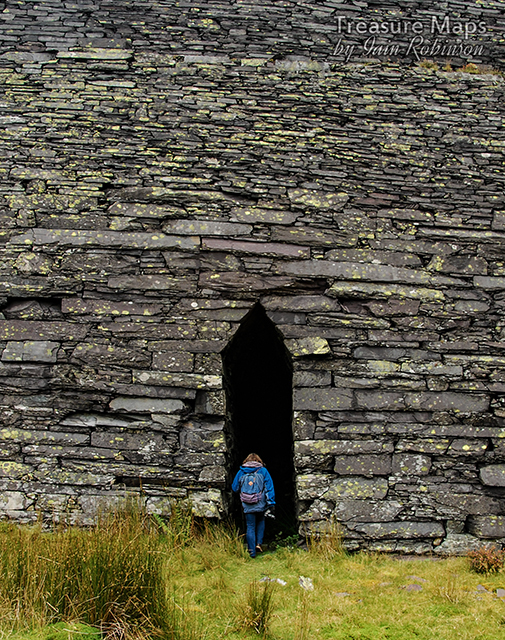 It owes much to the keyhole pattern and has a roof vaulted with massive chunks of slate. 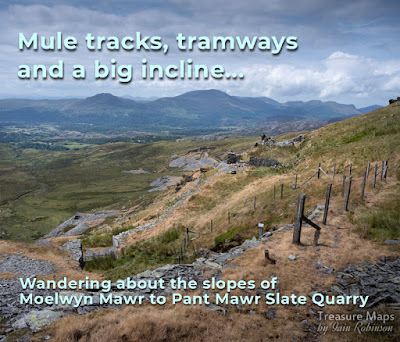 It would only ever be big enough to crawl into, and is handy (as far as powder stores go) for Llew Twrog, Alaw Manod and Clogwyn y Garw mines. 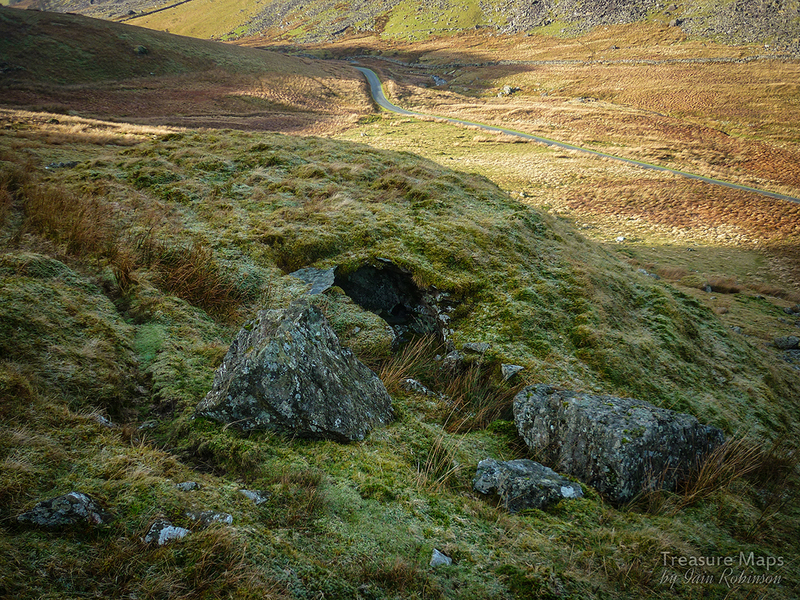 Then there is the keyhole store at Moel y Gwartheg, although this may have been a shelter as there appear to be alcoves built into the walls. Partly buried magazine at Brynglas, again well above the workings. The collection of my photographs gathered here is by no means exhaustive coverage of the subject, nor is it the entire number of magazine shots I have in my files, but hopefully these will inspire others to go hunting for the elusive powder magazine! 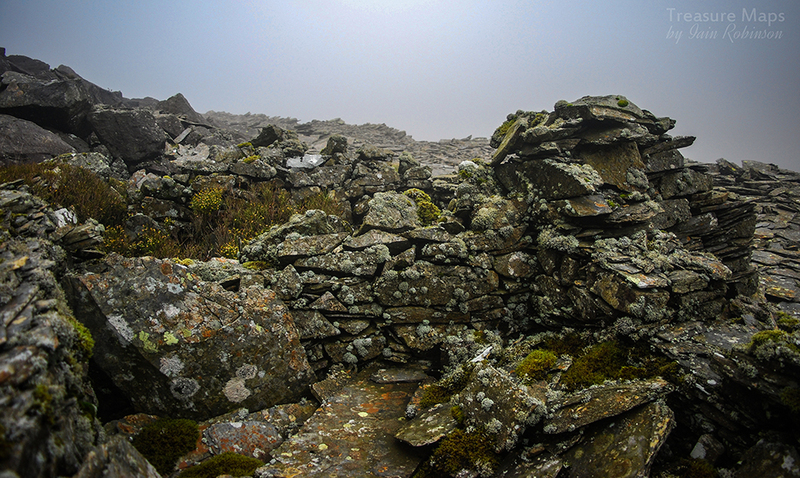 Classic opportunistic design- a magazine with a freestone boulder as one of the walls! 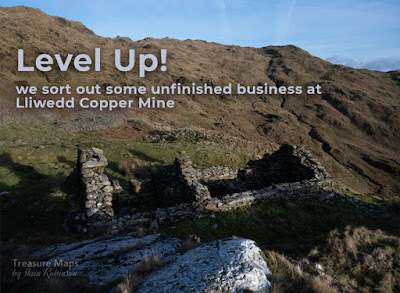 At Cwm Dwyfor copper mine. Classic square magazine at Cefn Coch. Square example at Cwm Cipwrth, with porch. 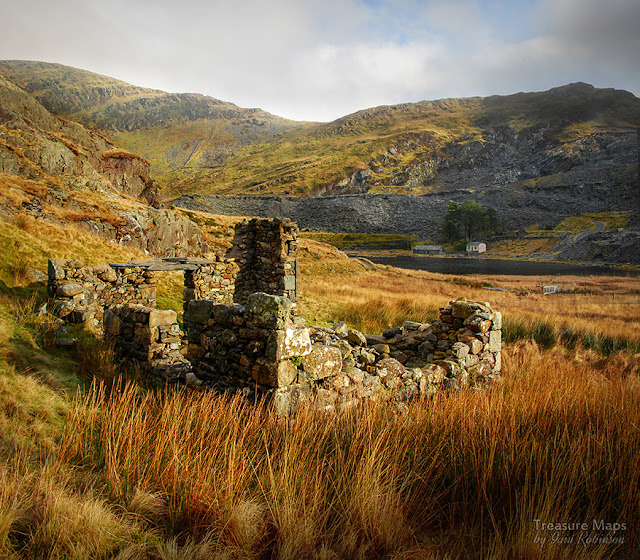 This probably also served the nearby Gilfach copper mine. Buried deep in the undergrowth - Gallt y Fedw, Dorothea. 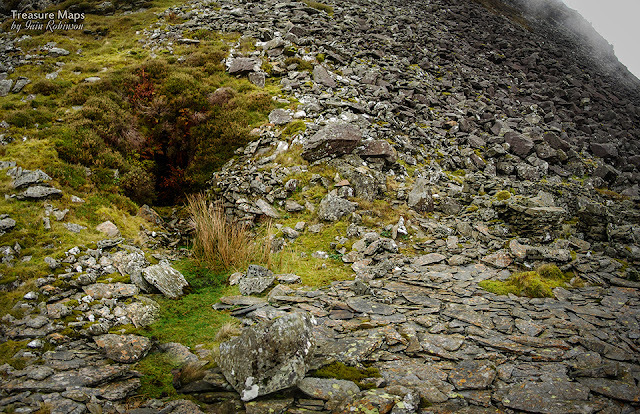 Lastly, a rather primitive magazine partly buried at Bwlch y Ddeufaen West quarry. 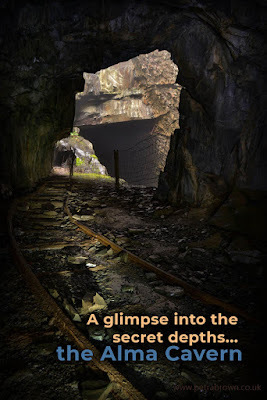 I fought with my conscience over this mine...whether or not to write about it. 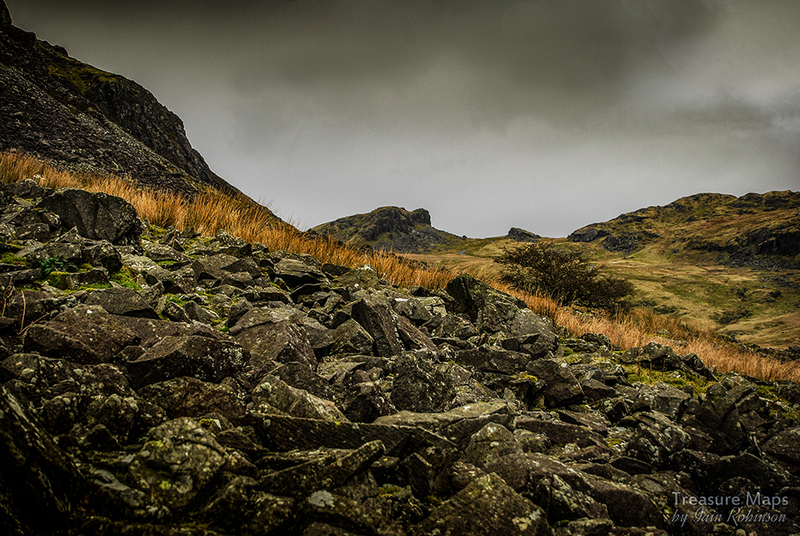 It was small, insignificant, perhaps completely uninteresting compared to the nearby thrills of Cwmorthin or Rhosydd. Yet it was a rather uneasy explore, because of the extreme fragility of the adit and the amount of water coming in. I don't want to be responsible for folk putting themselves in peril, but it's a shame not to share the photos and experiences. (Hopefully so that you don't have to!) I'll just let you make your own minds up about how foolish we were . 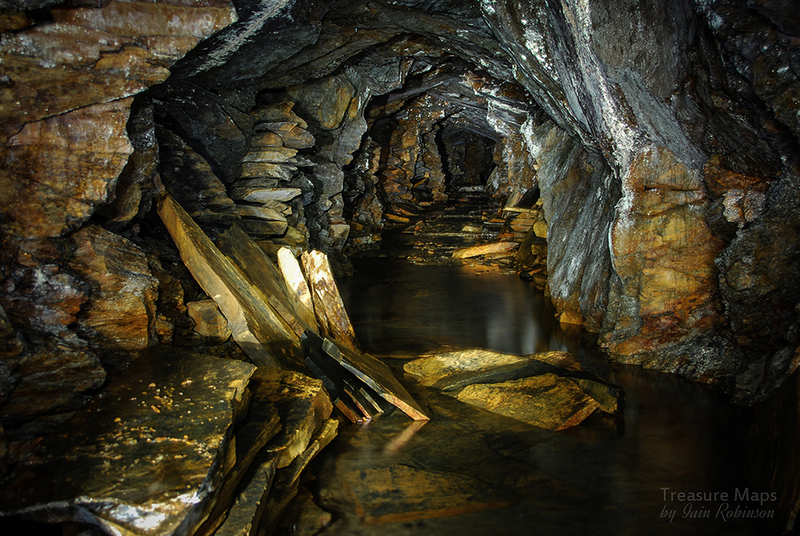 I blame Harold Morris, the venerable local mine explorer for drawing my attention to it. 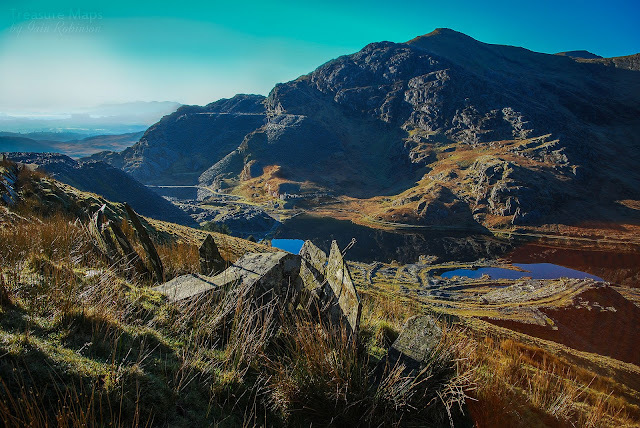 Harold has explored just about every excavation in the Blaenau Ffestiniog area and is a walking treasure trove of knowledge. He paid me a visit one Sunday and we roamed far and wide in discussions about lost mines, particularly on the Manod, which is practically our back yard. I mentioned a favourite of mine, Chwarel Llew Twrog...Harold countered with the suggestion that there were more open adits than I had realised, and he'd been in them. Afterwards, I mentioned this to Petra who opened Google Earth with unseemly haste. 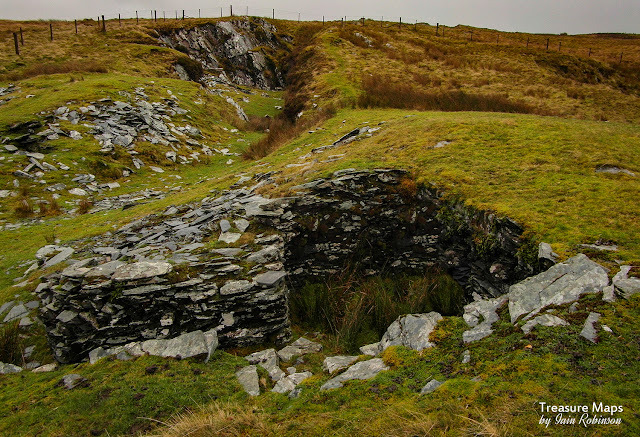 Sure enough, there was what looked to be a level beneath the cliffs known as Clogwyn y Garw, with what looked like a causeway, and a trial digging. The game was on! It couldn't be open, surely? And how had we missed this? Our day off dawned wet and dismal, but no matter; from the satellite view it looked like a modest yomp over the boulder field to the skirts of the Manod. We made it to an area below the causeway, which now, close up, looked like an impressive feature. The satellite view of course, tends to flatten things. Petra spotted the first adit, a modest trial that went in just a few yards. 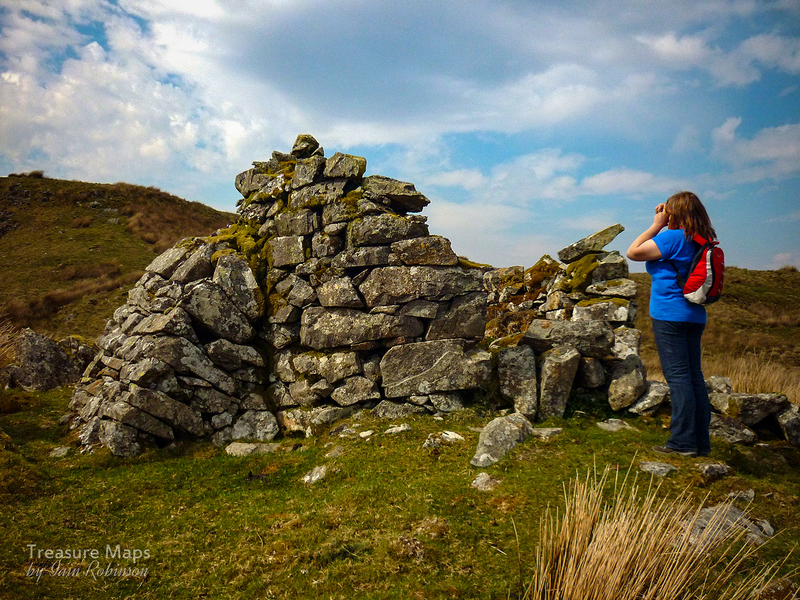 There were some jwmpr marked rocks outside and the ruins of some ramshackle structures. One looked like it could have been a wal; the other one, a circular relic, might have been a powder store, or equally, judging by the lichen growth, the remains of a prehistoric hut. There are many such remains in this area. There was also a larger ruin a little further down the hill towards the road, but I think that must be an old Hafod, or shepherd's hut. 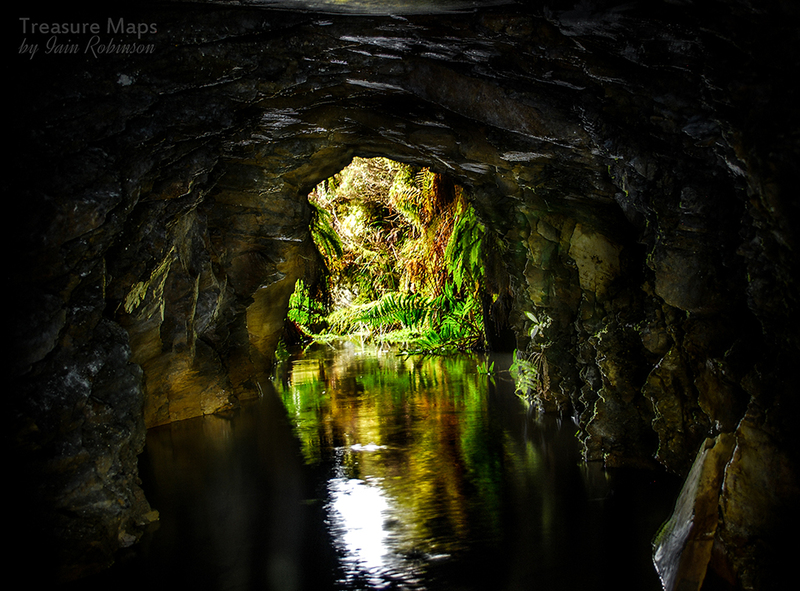 The adit looked inviting in a miney sort of way, but the water was deep and very cold. I gasped as it immediately reached the parts other mines rarely trouble. On with the lights. 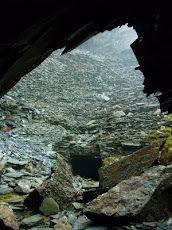 Deep mud on one side of the adit, but slate on the other. I became aware of a distant roaring like an aeroplane. It took a few seconds before I realised that it was coming from inside the mine. Distracted, I tripped, grabbing the wall of the adit. A big chunk immediately came away in my hand. Somehow I managed to keep my precious camera dry, at the expense of soaking most of everything else. Oh well, wet now, nothing ventured etc. The wall and roof looked a little sketchy, with slate de-laminating everywhere. I sternly reminded myself to be a bit more careful. Walking further in, the water became shallower, as is the way with most mine adits. 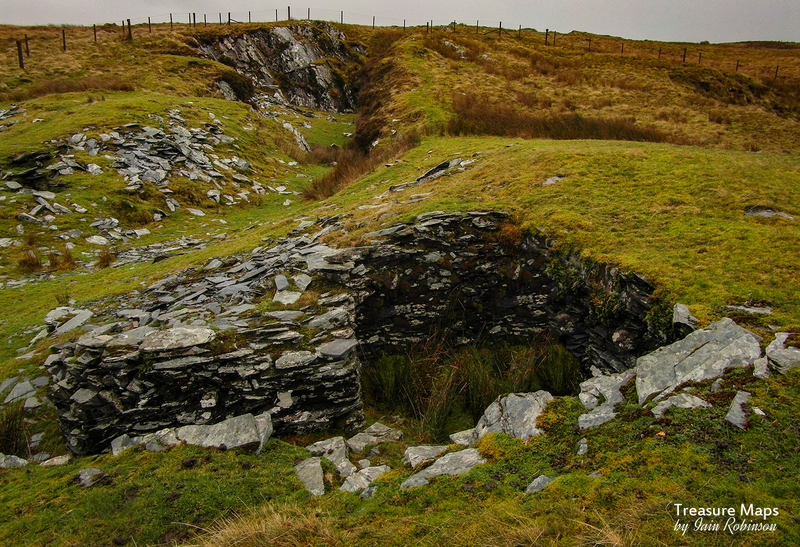 They are built to drain the mine, but inevitably get blocked near the mouth with debris, silt, dead sheep and general degradation, as had happened here. I could now see the sleepers on the floor, very fragile and almost rotted away. Deads were stacked up at the sides of the adit very tidily. Elsewhere, large coffin shaped slabs were leant against the walls, something I noticed at Llew Twrog as well. To my inexpert eye, these looked worth saving...I wonder why they were left? The further in to the mine we ventured, the louder the noise became. The passage did a turn to the left, past a shaky, delaminated roof section. Then, our torches picked out the water, blasting in from either side of a breach in the walls. We stopped to take photos, trying to keep calm in the now deafening, water laden atmosphere. My poor camera, I thought, as I adjusted the settings with wet, muddy fingers. 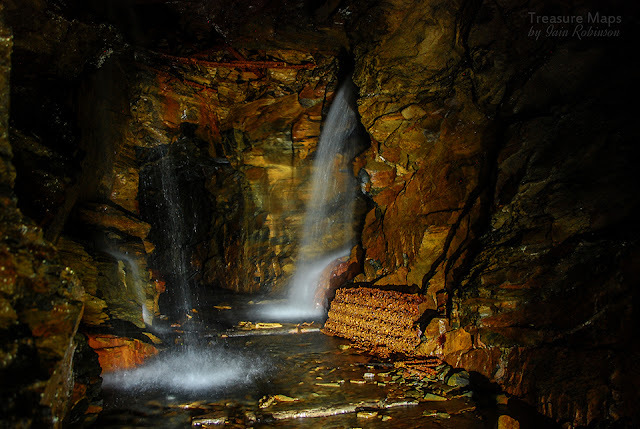 Without thinking much about it, we moved on past the waterfalls into the next couple of hundred yards as the mine drove into the bowels of Manod Mawr. 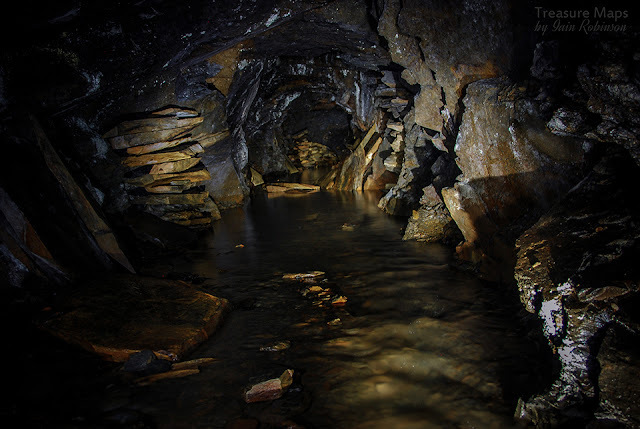 It looked like a side chamber had been filled with more deads...paradoxically, the mine seemed safer this side of the water incursion- precious comfort, as if the roof collapsed back at the waterfall, the way out was going to be blocked. Finally, we came to the forehead, a rather sad blank wall where the decision must have been taken to down tools and go elsewhere. I could almost sense the gravitational forces as millions of tons of Manod Mawr pressed down on us- we both decided to carefully retrace our steps. I still found time to marvel at the craftsmanship and accuracy of the adit and the lovely, untouched sleepers on the floor. Everything was tidy and workmanlike. We arrived back at the fall and I decided to take a couple more photos, as we certainly wouldn't be back this way again in a hurry. It was then I noticed the roof above where the water was coming in. 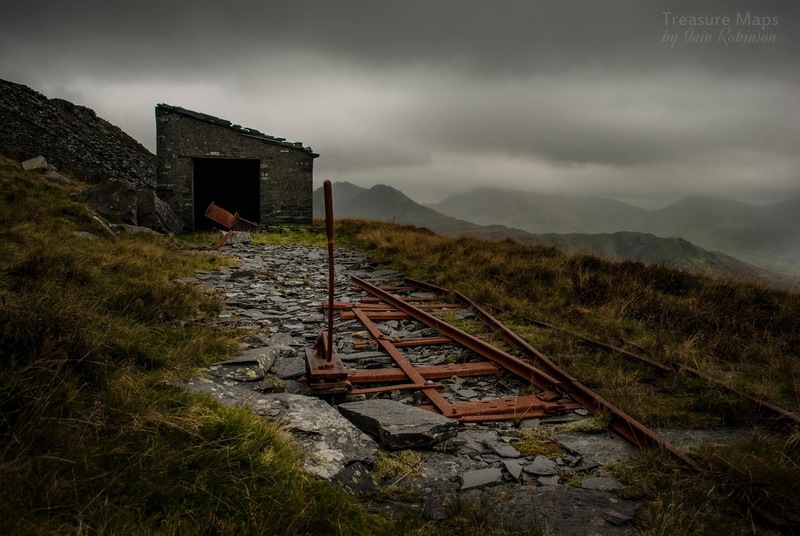 A few rails held in a mass of rubble and rock, just waiting for an ill-starred moment to collapse and entomb the mine forever. We have been in dodgy adits before, of course, especially in the old Holland's Cesail quarry at Oakeley. But there, the adits were quiet and you could hear when the rock spoke to you (it always says "get out!") but here, all you could sense was the water roaring, eroding your judgement. No warnings. We retreated, a sense of exhilaration gradually replaced by a feeling of foolishness. Outside, it was almost dark. The mist had set in. I realised that it had seemed warmer back in the mine. I was glad we'd done it, of course, pleased that we were still alive and that my camera seemed OK. We smiled at each other foolishly. Job done. Further research doesn't pull up anything new about the mine. It appears on the Ordnance Survey XXIX of 1901 but not before. Rails are indicated emerging from the level. I think the causeway must be made from waste, perhaps due to some restriction on the sett, as the boundary wall is hard up against the causeway. Tipping above would have been impossible. That must be why deads were stacked up inside as well. 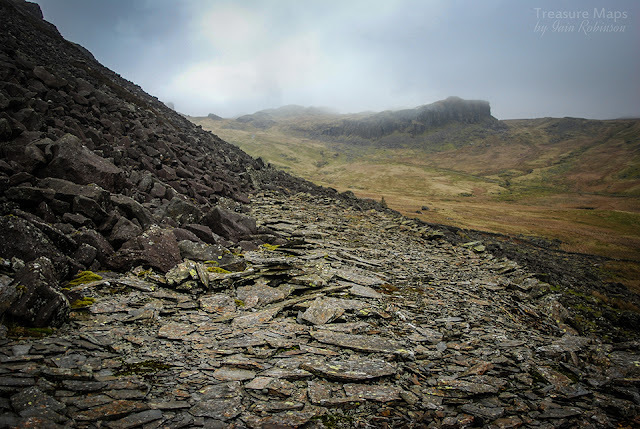 This part of the cwm is pock-marked by trials, you begin to see them everywhere once you start looking, but this had been a special one, on a par with Llew Twrog just up the cwm. It was probably opened in conjunction with that mine, as the method of working is similar. I don't know how they thought they were going to take product to market from here...perhaps they were waiting until things became productive as at Fridd a bit further up the hill, where a road was cut into Carreg y Fran. 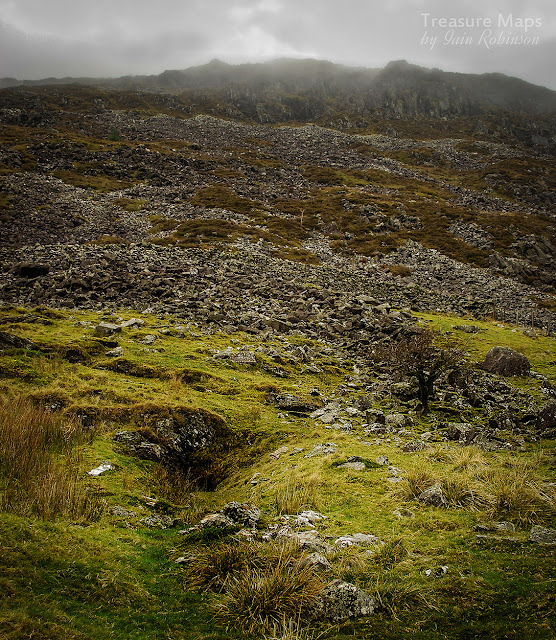 Whatever they found both here and at Llew twrog must have been moved over the boulder field by mule- and it is bad enough negotiating that on foot. 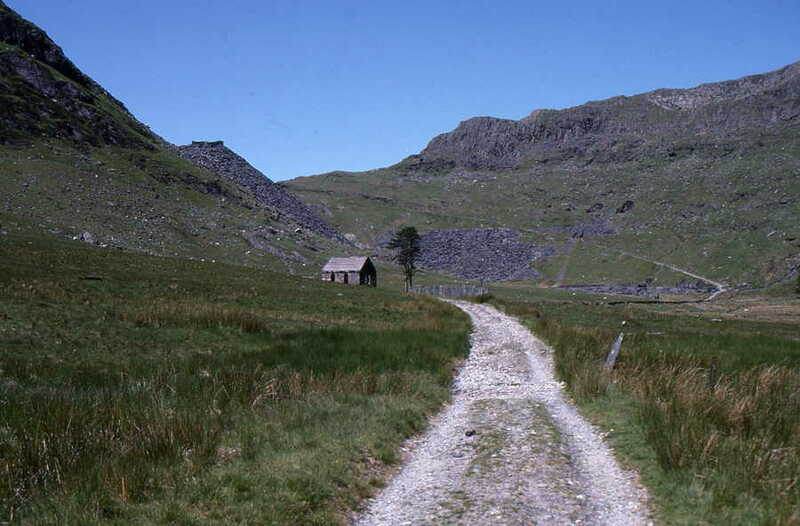 Penrhydd Bach combined shed and caban- shed on the right. Last home of "Holy War" from 1961. Before that, "Wild Aster" from the mid forties. Back in the day before the ubiquitous diesel truck, most quarries of any size boasted a couple of locomotives to shunt waggons around their internal tramways, taking rubbish to the tips, or rock to the mill. Of course, those locos needed somewhere out of the weather to shelter overnight, or be worked on. 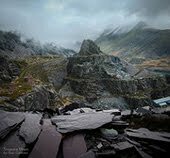 This was never more important than at Dinorwig, where the prospect of doing maintenance, out of doors, on a steam locomotive didn't seem like a very sensible idea. Most of the galleries are in exposed locations, and a good many of them are over the 1,000 foot contour line, right in the way of those snell Snowdonian winds. Pen Garret shed- a tandem example with the usual pillars for block and tackle. Home of "Rough Pup" and "Bernstien", the latter for 30 years. The locos didn't just shelter overnight either- they had major repairs done to them on the galleries. Because, the prospect of lowering a loco down the inclines to the works at Gilfach Ddu was not something to be taken lightly. Quite apart from the danger inherent with such an operation, the locos had to be stripped down and their motion removed to ride the inclines...reading some accounts, it seemed a risky business, one better to be avoided unless absolutely necessary. So it was that some locos stayed up in their lofty eyries for thirty years before going down to the works for overhaul. Perhaps a pretty major one, though- after 30 years of continuous use! Australia shed, 1600 feet up a mountain! Here it was that "Alice" lay for many years. She was in company with "Irish Mail" for a while, and before that, between 1930 and 1945, "Maid Marian". On a gallery in the Braich district like Pen Garret, the rubbish runs were nearly a mile long and then there was rock to be removed in "Car Cryn" (slab wagons) to the top of the incline and rubbish to be marshalled in "Wagan Dipio". Plus sorting, shunting and...derailing. This latter was not an unusual occurrence; wagons would fall off the indifferent trackwork, at which point the loco crew would have to get off their steed and reform the errant vehicle with crowbar and some basic Welsh invocations. Usually other quarrymen would pitch in and help, especially if it was the loco that had lost her feet- after all, a delay in sending slate to the mill or rubbish to the tip affected everyone's pockets. The loco drivers always reckoned that they were the fittest men in the quarry with all the running about, heaving couplings and chains, pulling point levers and, of course, re-railing. I haven't uncovered all the sheds yet, and this doesn't purport to be an exhaustive account, rather some of the highlights which give a flavour. 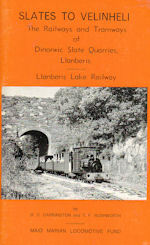 Unlike in other quarries, there are some first-hand records from the drivers and other quarrymen concerning the working and stabling of the locos, and these can be discovered in the books listed at the end of the post. 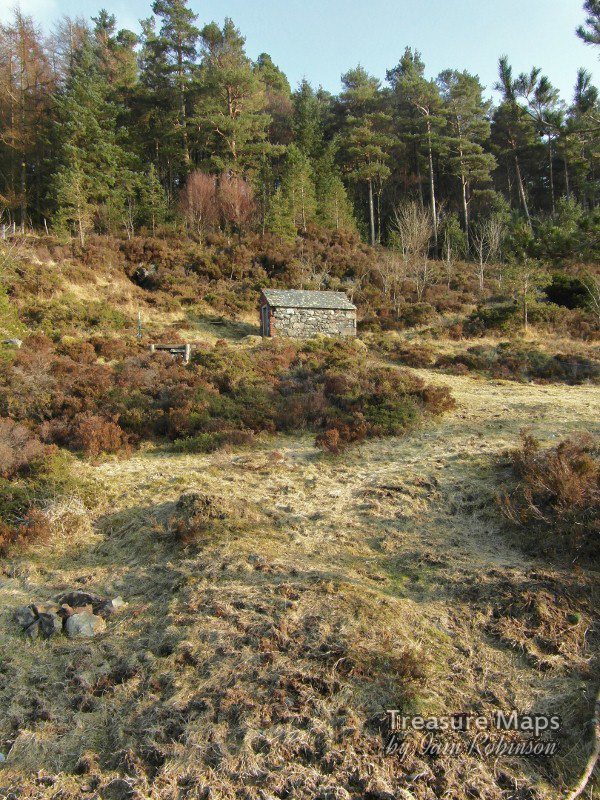 Lernion shed, on Braich district. 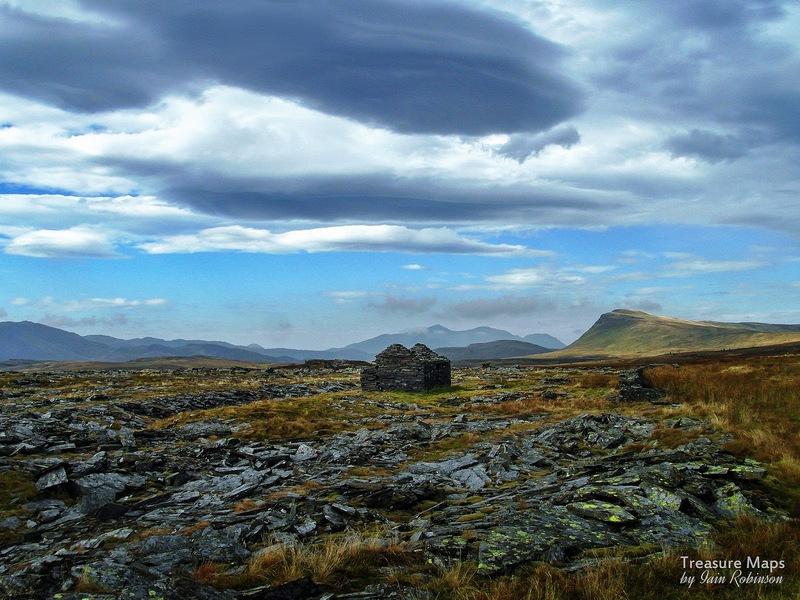 This was the highest shed in the British Isles, at over 1800 feet above sea level. Draughty... definitely a case of the thermals in winter! "Michael was resident here from 1931 until1945, then "Red Damsel" and finally "Holy War" until 1960 when moved to Penrhydd Bach. I've not spoken much about the locomotives, thinking that most folk are familiar with them...Hunslet, mostly... small, pesky but rather cute...the Jack Russells of the loco world. If this doesn't ring a bell, then you are most fortunate and have a wonderful journey of discovery ahead...I have provided references at the end. The other wonderful thing is that many of the latter-day locomotives are still with us, working on preserved railways up and down the country. Indeed, most have been in preservation for longer than they were working, but I really don't want to go into that! I tend to think of them as old friends, as I have been reading about them and looking for them since my teens (not yesterday) -I always have a few misty moments when encountering them in their new habitats, where I am sure they are less taxed! 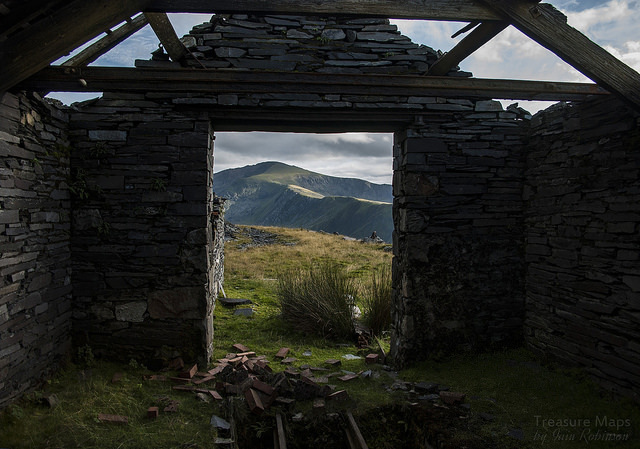 A view of Snowdon from Lernion shed. 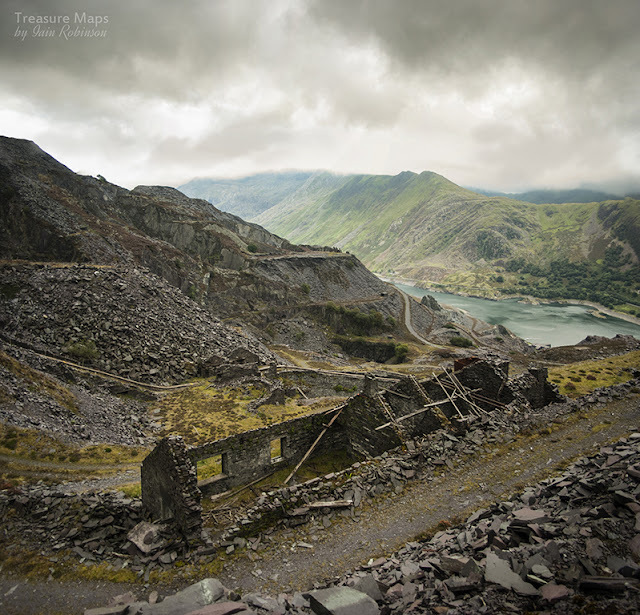 Most of the sheds in the quarry were self-contained and followed a pattern- there would be two slate pillars outside the front doors with a strong girder between them, which would act as a support for pulley blocks to lift the loco off it's wheels, or remove the boiler. Inside, there would be a pit, essential for inspecting and working on the motion, for valve setting and generally oiling and checking things. Some of the sheds had a store attached for essential spares like firebars etc and to keep coal dry. Others had a caban, as at Penrhydd Bach. Or sometimes there was a tandem shed, as at Pen Garret. All were made of slate. 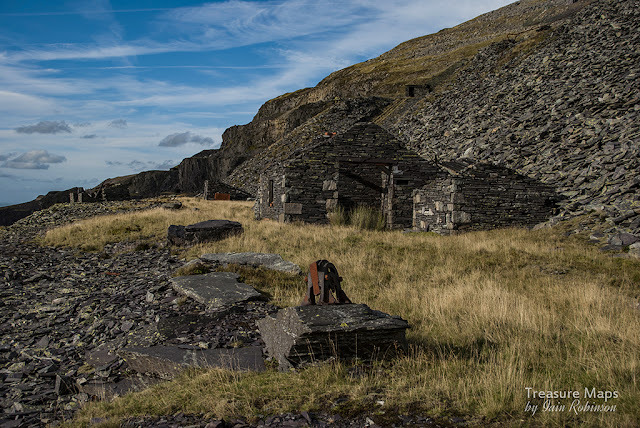 There were other sheds around the quarry for locomotives to shelter in during blasting operations, as damage to a loco could be expensive in materials and man-hours, let alone the dire consequences of having to explain the damage to management. These sheds are in the form of simple open-ended shelters, like a very over-engineered car port. There's a photo of this structure in J.I.C. 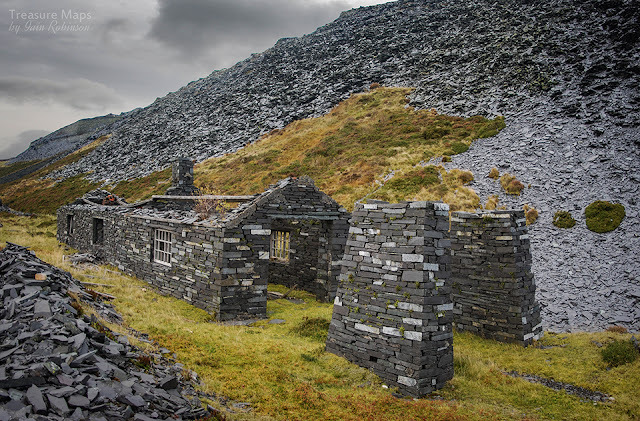 Boyd's book on the quarry, which he captions: "In such shelters as these, locomotives might lurk during blasting operations..." Pen Garret level, Dinorwig. Boyd's photo is from the other side, looking towards Garret and is an interesting study, if you have the book. Of the locomotives themselves, most galleries had one or two, and they were crewed by the same folk for years on end. An older man would be the driver, with a young lad, or teenager as the "fireman"/shunter/tea brewer/general gopher. Many young lads had the opportunity to join family members in a "bargen" with a team of rockmen, or work in the mill, but a surprising number wanted to crew the little locos. It wasn't really a popular choice with the other lads, as it was seen as a sinecure and rather unskilled. Mickey-taking could ensue. The wages were a little lower to begin with, and there was always the matter of waiting for dead men's shoes. 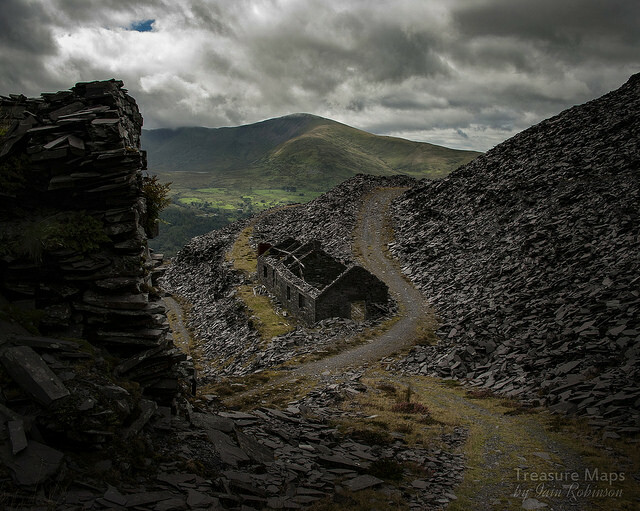 The little Hunslets certainly are easy to drive- I have spent a couple of very enjoyable days abusing slate trucks with "Lilla" and can vouch for that- but factor in all the things you would have to know about the sometimes labyrinthine working practices and the unexpected events on the galleries and I don't think it was such a pushover. 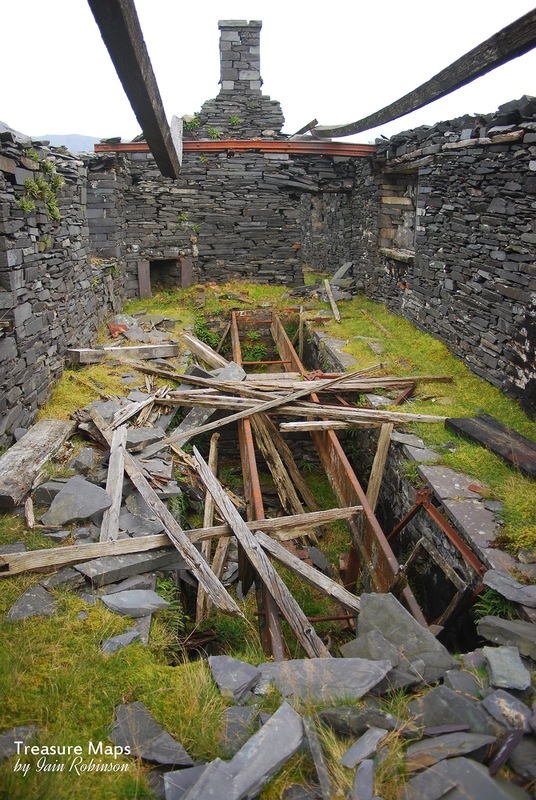 Plus, the locos had to be lit up an hour and a half before work started, which meant climbing the endless steps up the Foxes' Path, for instance to Australia level, well before even the quarrymen had flung a leg out of bed. In the early days, the drivers were encouraged to take a pride in the locos by a system of bonuses and a sort of league table. Those that failed in this endeavour were generally ill-regarded and could be turfed off the job if they didn't mend their ways and buy some Brasso. Even in the fifties, photographs of the locos show them to be well cared for and clean in most examples. Later in the story, there is the poignant moment in the lives of the sheds when they were abandoned by their tenants, who were never to return. Some, like Alice on Australia level, stayed for a long time after closure. In the sixties, early on in the preservation movement, most thought it was too big a project to rescue her and send her down the now sketchy inclines, although other engines, like "Michael" did take the plunge. It was left to members of the West Lancashire Light Railway group to perform the rescue operation in 1972, where the RAF and their Chinook Helicopter had failed before them. The full story can be read in Cliff Thomas's excellent book...suffice to say that she is now restored and has even had some trips abroad! 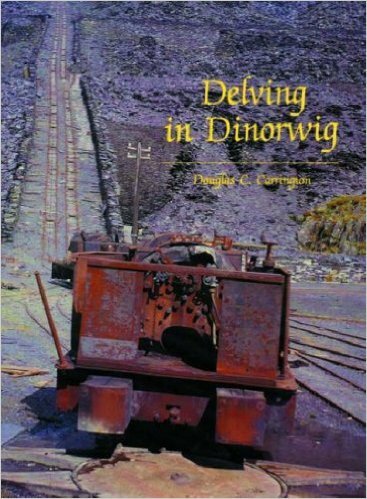 Douglas Carrington's book also has some wonderful accounts and photos of other loco rescue operations at Dinorwig. It's nice to happen upon previously unfamiliar photographs of the locos in their sheds at the quarry, and scrutinise them before realising where the location is, whereupon a warm glow of recognition permeates the sentimental mechanisms of this old ferroequinologist. I have particularly enjoyed finding the locations in Boyd's photographs. Finding little bits of graffiti from the thirties and forties is also very rewarding, even if it is sometimes scrawled over by the ill-educated churls who wander the galleries in search of things to throw. 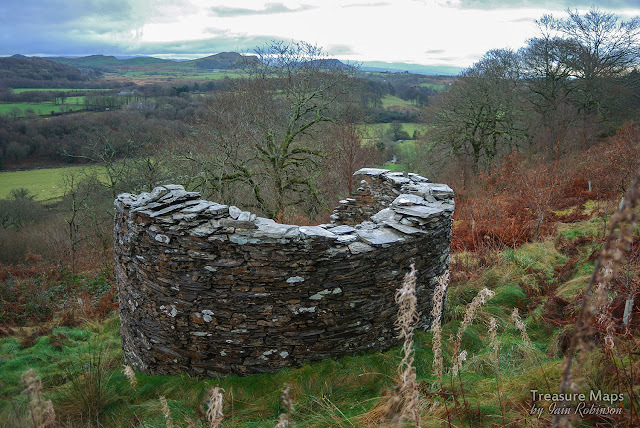 Finally, I noted something special at the last shed I visited, at Pen Garret on the Braich tip runs. The shed was approached by a cinder path, something that will chime with railway enthusiasts of a certain age who remember bunking BR loco sheds. 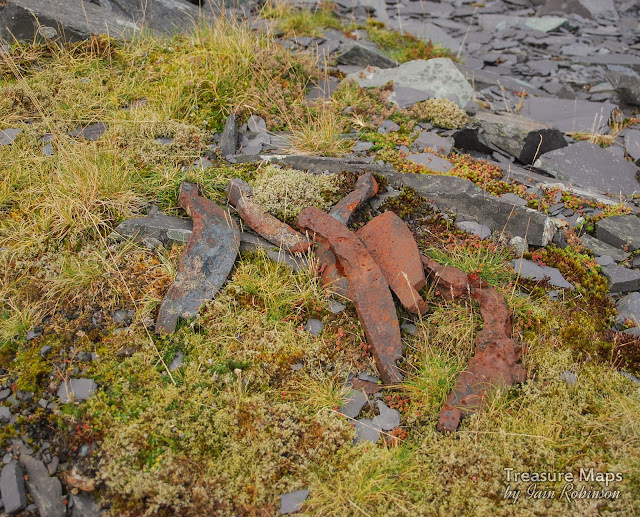 That the cinders were without doubt from steam locomotive fireboxes was almost too nostalgic to contemplate, especially as soon afterward I made the discovery of some old firebars, lying in a pile where they had been discarded probably sixty years ago. 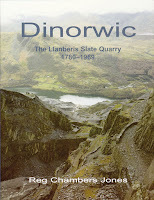 In conclusion, if you have a sympathy for small, impudent steam locomotives and a love of quarries, visit Dinorwig . Go quietly and please don't throw or displace anything. Just stand and feel the little iron ghosts around you as they chuff fussily about the galleries. Penrhydd Bach, with the later 1960's haul road a little too close for comfort. A different type of loco blast shelter in one of the "A" inclines...subsidence has moved the walls nearer together over the years...Petra is quite slim! 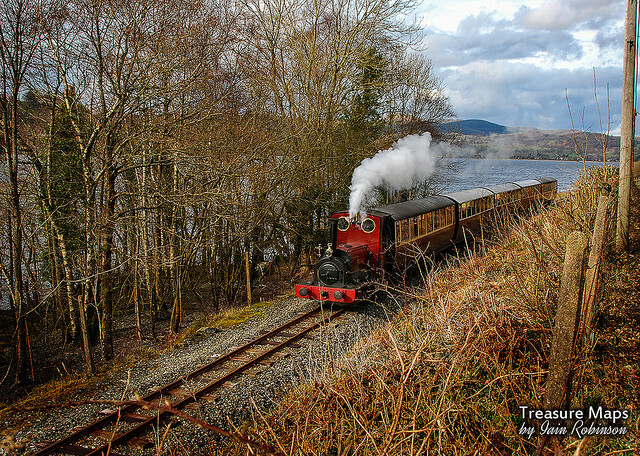 "Quarry Hunslets of North Wales - The Great `Little` Survivors"
"Narrow Gauge Railways in North Caernarvonshire - Volume 3"
"Dinorwic: The Llanberis Slate Quarry, 1780-1969"
Maid Marian, on the Bala Lake Railway in 2016.